Mittens Writes: I walked how far? We walked nearly 10 miles yesterday, if you figure in distances walked inside buildings, museums, gardens, etc. 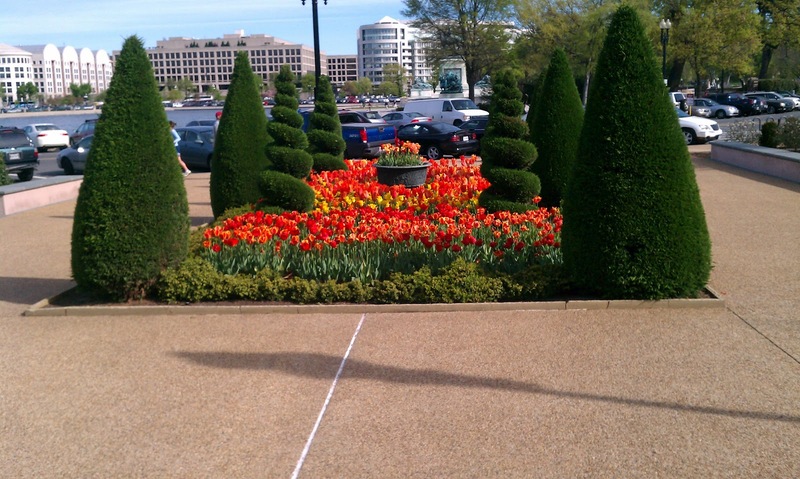 Google maps said it was 8 miles, but we must have walked an additional two between the botanical gardens, wandering around the monuments at the Tidal Basin, and inside the National Gallery of Art. My legs are so stiff today that I'm hobbling around the house. I'll be lucky if I can move at all by tomorrow, after 8 hours working the concession stand tonight. My legs won't straighten all the way, so I suppose we should call it a concession hunch over, rather than stand. 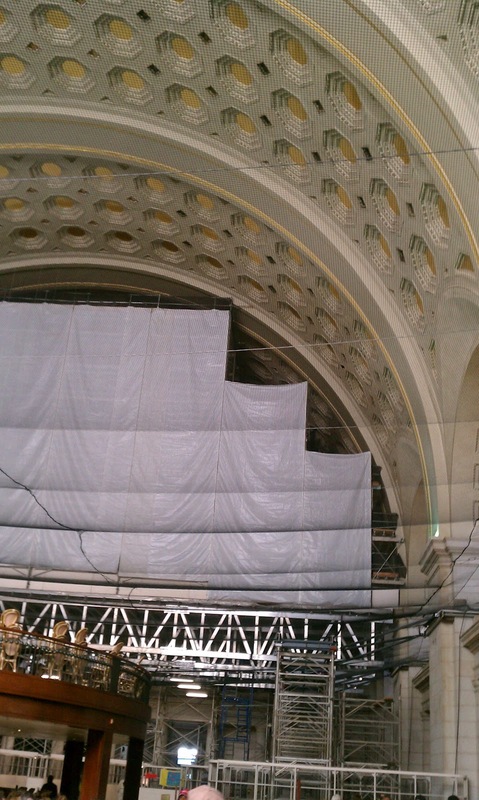 Union Station, still recovering from last year's earthquake. We noticed a lot of buildings covered in scaffolding, including the interior of Union Station. There was a net all across the main terminal building to prevent any falling debris from hitting travelers. The National Gallery's East Building was also stripped of a lot of its marble facade so brick work beneath it could be repaired. 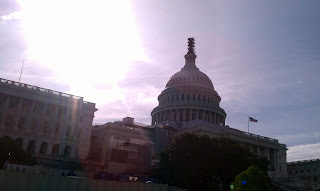 The statue atop the Capitol building was caged in scaffolding. I love tulips. I used to grow them all over my front yard at our old house. I tried planting them for a few years here, but as soon as they bud, the deer come along and eat them. I end up with a field of green sticks. I gave up on tulips in my own garden, so any time I see them thriving like this, I have a fit of jealousy and take a picture. 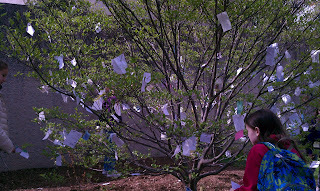 Yoko Ono installed this Wish Tree in the Hirshhorn Museum's sculpture garden. 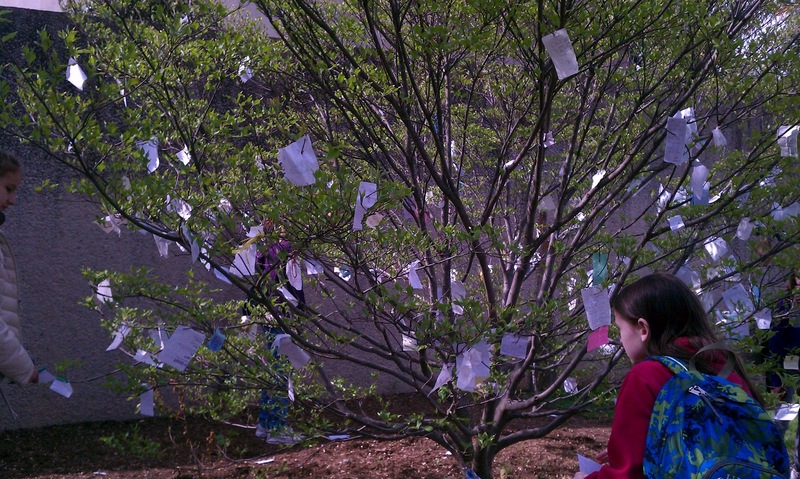 We all added wishes. I love the Castle. 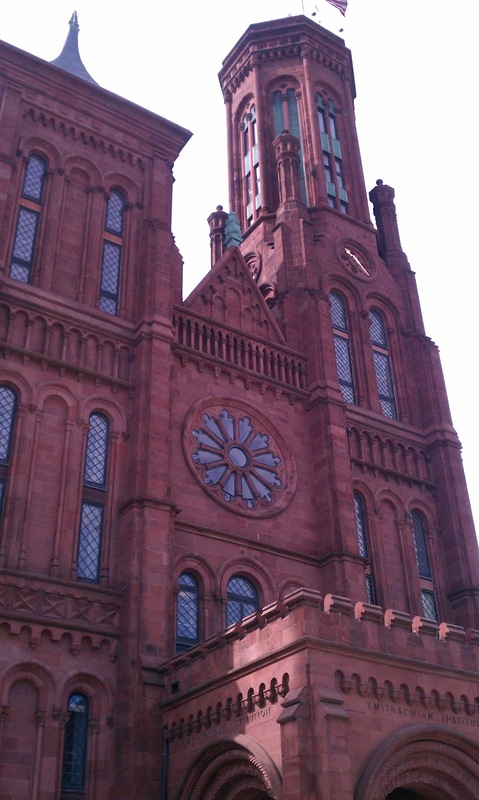 It's so incongruous on the National mall, the lone brick building among classical marble and modern architecture. 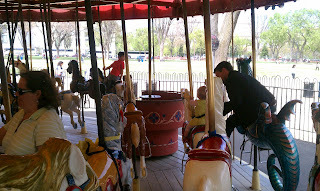 And it has a carousel out front, which I was forced (sort of) to ride. 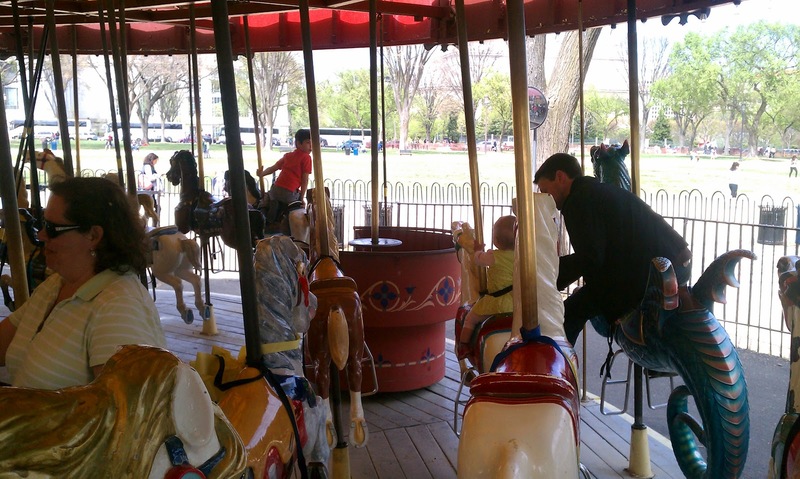 After a minute on a carousel, I always think, "Ok, that's enough. Any time you want to stop now." I don't like going in circles, apparently. 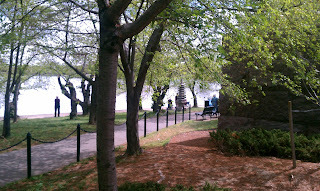 We went to see the cherry trees, even though they bloomed a few weeks ago. We still took the ranger tour, and learned about the other gifts from Japan around the Tidal Basin, including this stone pagoda. 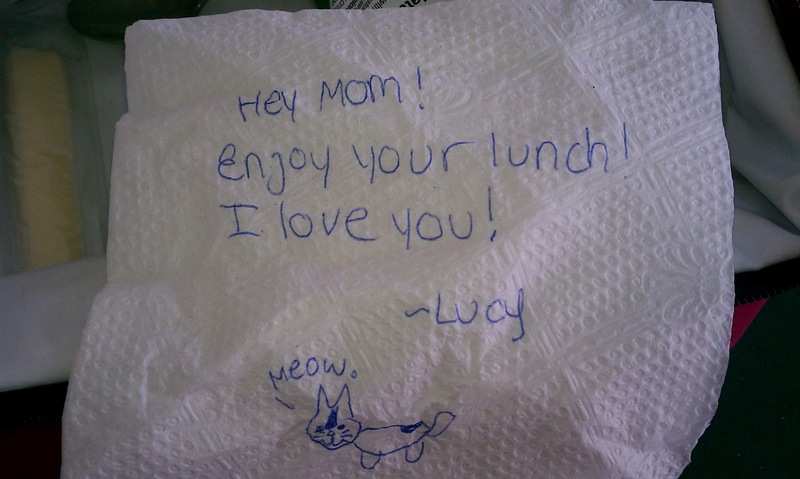 Every day, I write a little note on Lucy's napkin in her lunch box. 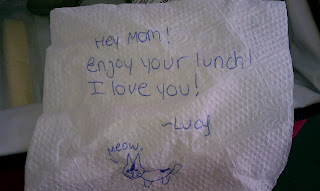 I didn't realize she'd done that on my napkin until I opened my lunch. And yes, I dug tissues out of my bag so I wouldn't have to use this napkin. I was so mad that my phone died before we got to the rest of the museums, but the main exhibit we wanted to see didn't allow photography anyway. It was a display of 30 silk panels painted in the 1750's in Japan. It was really beautiful, depicting birds, animals, and plants with incredible detail. The exhibit has never traveled outside of Japan, and is rarely even displayed there. Since it's only here for a month, we were really lucky to see it. We also ran out of time to see the National Archives, which made me sad, but I've been there before, and I can go back any time I want. It's not like it's going anywhere. Still, I wouldn't trade yesterday for anything, aching feet and all. Why? When I asked Lulu what her favorite thing about the day was, she replied, "Everything." It doesn't get any better!